Hot drinks and an array of homemade cookies and cakes were whipped up for parents as part of the World’s Biggest Coffee Morning. It was a pleasure and a privilege to take part in the annual fundraising event organised by Macmillan Cancer Support. 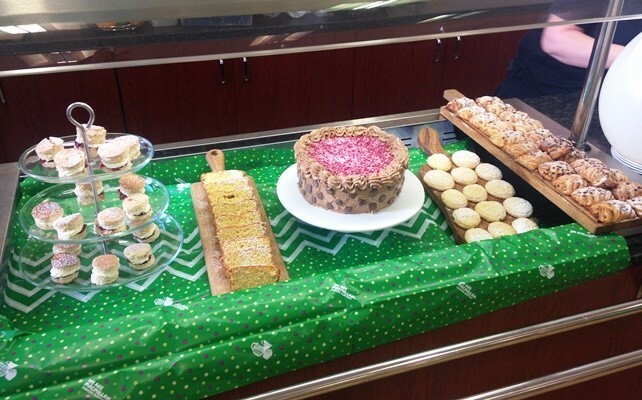 Catering Manager Gareth Long and his fantastic team served lemon drizzle slab cake, chocolate gateaux, miniature Victoria sponges, cookies – all homemade, and Danish pastries. Parents and staff took part in a ‘guess how many icing spots on the cake’ competition and raised £52. The charity has so far raised more than £2 million through various coffee mornings held on Friday and at the weekend. Click here to find out more about the work of Macmillan Cancer Support.